Read the SuCasa Magazine Article regarding our being featured as the 2011 Fall Parade of Homes Featured Builder here in Albuquerque, New Mexico. We have two Homes that are in the Fall Parade of Homes, one of which is the Featured Home! We are honored to have been awarded this position for the Fall Parade of Homes and it is a testament to the manner in which we have conducted our business during the past few years in which the market place has become nothing less than challenging. 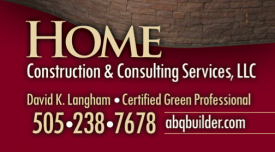 Please explore our website to learn more about us and we look forward to meeting you during the Fall Parade of Homes!